This is going to be much shorter -- and much more vague --than it should have been, because I was in a rush to get out the door on the day I took this back to the library and therefore forgot to take my notes out of the book. Which is a crying shame because I can't cite some of my favorite lines (on the other hand, I don't have to pick from my favorites). I'm actually pretty annoyed with myself because of this -- I spent time on those notes. 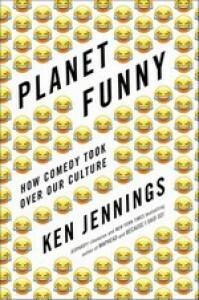 In short, Jennings is writing about the way that humor -- the entertainment culture in general, really, but largely through humor -- has taken over the cultural discourse in this country, so much so that you can't make a serious point about anything anymore without injecting a smile or a laugh. This could be subtitled, Neil Postman was right. Jennings looks at this phenomenon through a historical lens (mostly over the last century) and a contemporary lens -- analyzing and commenting on both. The initial chapters on defining humor, the history of humor and academic humor studies are probably the best part of the book -- not just because of their scope and subject matter, but because how Jennings is able to be amusing and insightful while informing. (although the amusing part is problematic given the thesis of the book). I enjoyed learning about the use of humor in the 20th Century -- who doesn't associate the two? I don't remember a time when the best advertisements/commercials weren't the funniest (other than things like the crying Native American anti-litter AdCouncil stuff). But there was actually a time when that was looked down on? Who knew? I also particularly liked the history of Mystery Science Theater 3000 and then pivoting that into a look on the way even entertainment changed in the last few decades because of the funny-ification of all things. Jennings gives a pretty decent defense of Alanis' "Ironic" (while enjoying a few shots at it, too) -- and the ensuing discussion of Irony the cultural waves embracing and shying away from Irony, Enjoying things Ironically, and a need for sincerity was excellent. Politics, obviously, has fallen prey to this comedy-take over as well. From Nixon shocking everyone by showing up on Laugh-In to Clinton (pre-presidential candidate) on The Tonight Show to then-candidate on The Arsenio Hall show to every political player doing Late Night shows. Obama appearing on Maron's podcast and Between Two Ferns (crediting that appearance with saving ObamaCare?) and onto the entire Trump campaign. At this point, the book got derailed -- I think -- by getting too political. If Jennings had kept it to Trump's embracing/exploiting the comedy takeover, I probably would have enjoyed it -- but he spent too much on Trump's politics (while having ignored Nixon's, Clinton's, Obama's), enough to turn off even Never-Trump types. I'm pretty sure that the book was almost complete about the time that Louis CK's career was felled by allegations of sexual misconduct -- which is a shame, because Jennings had to go back and water-down a lot of insightful comments from Louis CK by saying something about the allegations while quoting the comedian. At the same time, it's good that the book wasn't completed and/or released without the chance to distance the man from the points used -- otherwise I think Jennings would've had to spend too much time defending the use of those quotations. I think Jennings lost his way in the last chapter and a half or so -- and I lost a lot of my appreciation for the book as a whole at that point. On the whole, it's insightful writing, peppered with a good amount of analysis, research, interviews, and laughs -- outside of his weekly trivia newsletters, I haven't read Jennings and he really impressed me here. In short, it's a fun book, a thought-provoking book, and one that should get more attention and discussion than it is. I may quibble a bit with some of the details, but I think on the whole Jennings is on to something here -- and I fear that it's something that not enough people are going to take seriously until it's too late.